International flights arrive at Carrasco international Airport, located in Canelones Department nearby the capital, Montevideo. From the airport you can take a bus, transfer or taxi to the Tres Cruces Bus Terminal. There are two bus companies, Turil and Cot, with destination Colonia del Sacramento. Travel time from Tres Cruces bus terminal to Colonia is about 2: 40 hours. It is very easy to travel by plane to Buenos Aires and, once there, take a ferry to Colonia. From Buenos Aires there are different ship companies that make the journey to Colonia. The frequency is 4 or 5 journeys per day. The travel time depends on the type of ship, 1 hour the faster ones and 3 hours the slow ones. From Montevideo, take the route 1 (ruta 1) that goes directly to Colonia del Sacramento. It takes approximately 2:15 hours, (180 km). From Buenos Aires take the route to Gualeguaychú, there cross the General San Martín Bridge over the Uruguay River and enter Uruguay through Fray Bentos city. 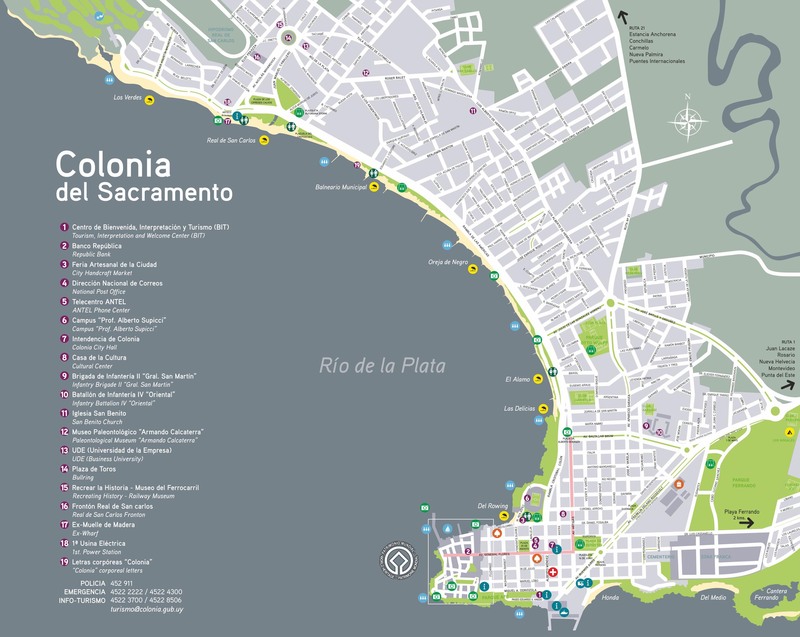 Take route 2 (ruta 2) to route 55 and route 21 to Colonia del Sacramento. Estimated duration 6 hours (470 km). International buses arrive from Brazil, Argentina and Paraguay to Tres Cruces Bus Terminal in Montevideo. There are two companies buses, Turil and Cot, with destination Colonia del Sacramento. Travel time from Tres Cruces bus terminal to Colonia is about 2: 40 hours.